If you've been reading my blog for any length of time you've probably seen me mention powerchair football a time or two. 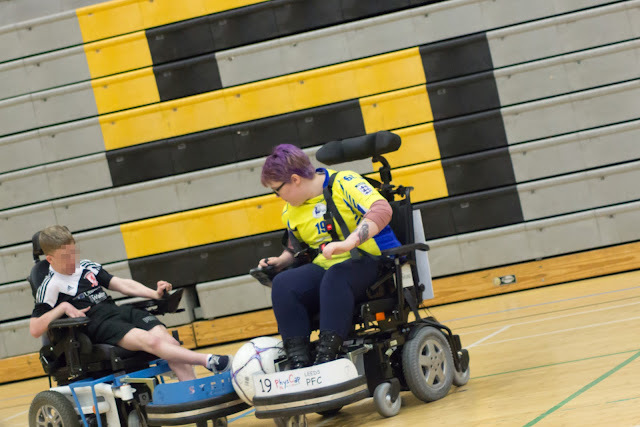 Powerchair football is, hands down, the most amazing things I do, but it is also one of the most unknown disability sports so I thought it was about time I did a post about it. I've been meaning to do one for a while but since I am the person who takes the photos at powerchair football there aren't an awful lot of photos of me. I think this post contains all the ones I have & they were all taken by my mum on my camera. Anyway, powerchair football is kind of like 5 a side football except there are 4 a side & we are all in very heavy wheelchairs that can move at speeds of up to 10 km an hour. There are a few rules that are a bit different (most notably the 2 on 1 rule & the 3 in the box rule) but generally it's easy enough to follow if you know how football is played. I think the biggest difference is probably that it's mixed age & gender, you can have teams with players as young as 10 & as old as 60 without being at all unusual. 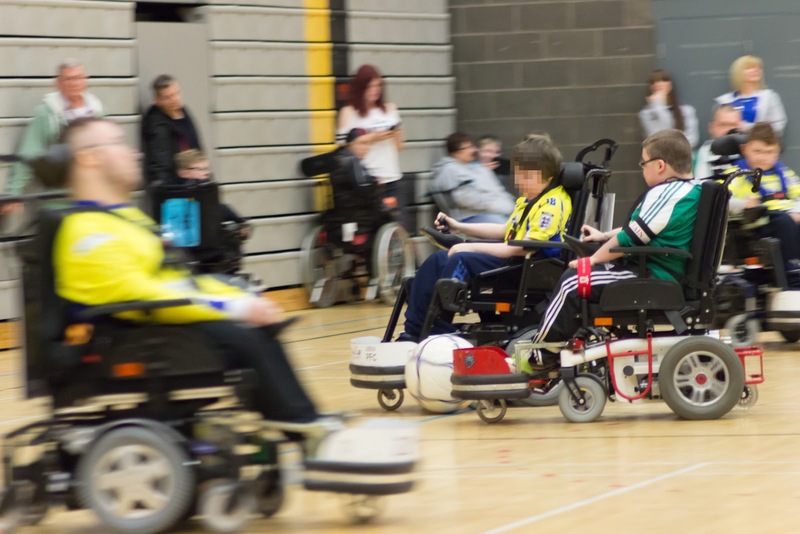 Powerchair football is played in specialist 'sports chairs' usually the Invacare TDX or the or the Invacare Storm. The Storm is like a 'normal' powerchiar, big wheels at the back & little wheels at the front but the TDX (the chair that 90% of my club has) has 6 wheels, big wheels in the middle & two sets of little wheels - one set at the front & one at the back. In addition to there being different kinds of chairs, we have 3 different kinds of bumpers. Bumpers (the white thing on the front of my chair) are key to playing powerchair football, they are the part of the chair you dribble with, tackle with, pass with, the works. There are 3 main kinds, the one that comes with your chair (not great), the striker (the one most people use - it's all metal, adaptable to use even on day chairs, rounded & good for everything) & the boa predator (square, amazing for striking the ball harder & faster than any other attachment, not as brilliant for dribbling & 100% the one I want). I'm probably getting super technical at this point but powerchair football is something I'm very passionate about. It's a really fast paced, technical game that's a lot of fun for everyone; the team I play with (that has won our league, not that I'm bragging) is me, 1 18 year old & then a bunch of 10/11 year olds & we are all just about the same level & all have so much fun playing. For so many of the people on the team, powerchair football is the only team sport they've ever been able to play & they put their all into it. I first started playing powerchair football only a few days after I got my first powerchair & I have gained more from it than I could ever have imagined. 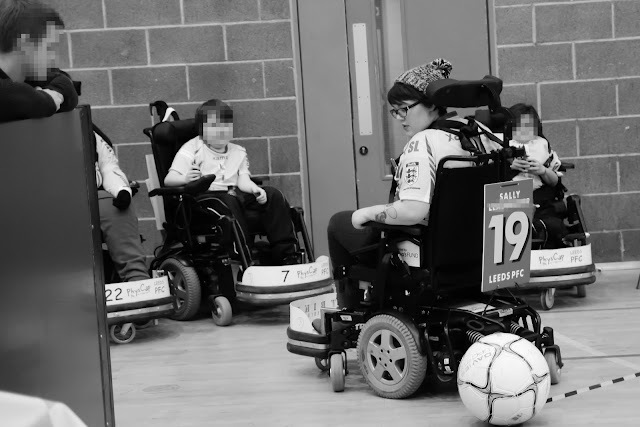 From little things like confidence in my chair to big things like regaining confidence in myself powerchair football has been unbelievably good for me. I have gotten into sports photography because of it, I have done a coaching course because of it, I have met so many amazing people & played some amazing sport & loved every second of it. It is imposible for me to be 100% coherant about powerchiar football because honestly, by the time I've gotten used to the speed of the sports chair (about 5 minutes into a session) my brain is already starting to get foggy & bleary but I wouldn't trade it for the world. 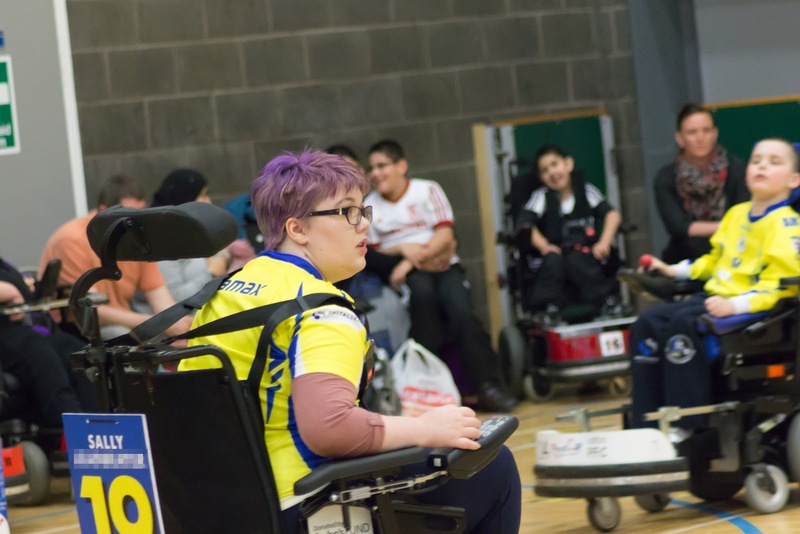 Powerchair football is the best thing I've ever done & I think I'd have missed out massivley if I'd never been able to play it. For all the good parts of the sport, it is also amazingly expensive to play. The footballs cost £36+ each, the bumpers cost nearly £350 & the chairs cost close to £5000. Every club has to fundraise constantly to afford the cost of running the club, maintaining the chairs & buying new sports chairs so clubs can continue to grow. The coach for our club is currently raising money to do a sponsored push, if you'd like to donate this is the link. If you've read this far & think that powerchair football sounds like a lot of fun this is a list of all the registered clubs in the UK, there are over 50 now so hopefully there will be at least one near you. You don't need to have a sports chair, or even a powerchair to try the sport out. If you get in touch, most clubs will be able to find a way for you to try the sport out or at least come to a training session & see what it's all about.